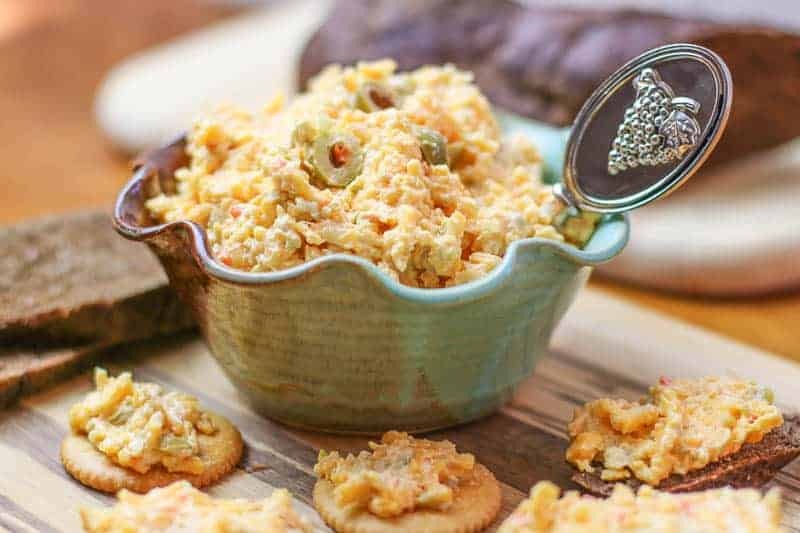 This easy homemade olive pimento cheese spread recipe has been passed down to me from my Great Grandmother. It is simple, delicious, and quick. Serve it over Rye Bread, Pumpernickel, French Bread, or crackers. If you are on a low carb diet, eat this on veggies. It is a special favorite recipe to my family, and I hope it will become a favorite in your home too. Growing up, my mother went all out for the holidays. She typically did not indulge my brothers and I with lots of sweets and junk food. We ate rather healthy. On the holidays however, she would make tons of desserts, appetizers, and homemade snacks that were incredible. Special dishes were part of every holiday celebration. She would make enough to eat throughout the whole week. 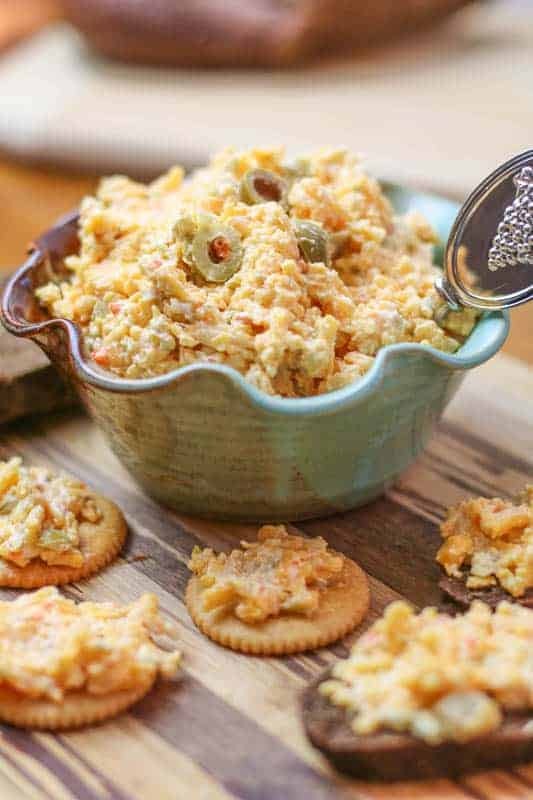 This olive pimento cheese spread recipe was one of the little goodies that she would make. It is thicker and richer than the typical pimento cheese spread. It also has little sharp bite and tons of flavor. 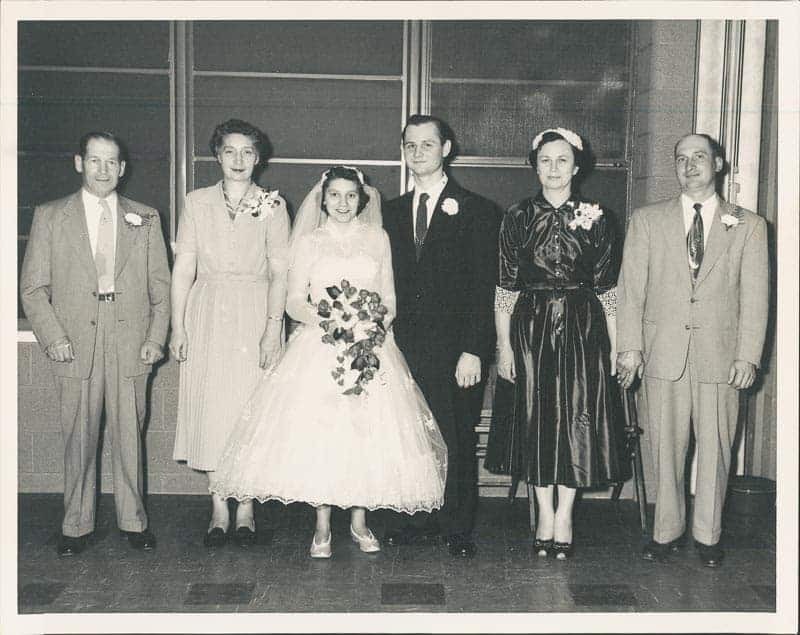 The pimento cheese spread recipe came from my Great Grandmother Marie Kriz pictured in the right of my Grandmother Bonnie Kriz’s wedding picture. I never had the opportunity to meet her because she passed away before I was born. But I am told that she was a kind, loving, thoughtful woman. My mother would spend hours with her cooking and baking. Being the first child in a family of six children, my mother often felt missed and looked over as a child. However, my Great Grandmother Marie made my mother feel loved, special, and important. My mother treasures those moments and memories. My mother loved her dearly and she remains one of my mother’s favorite people. 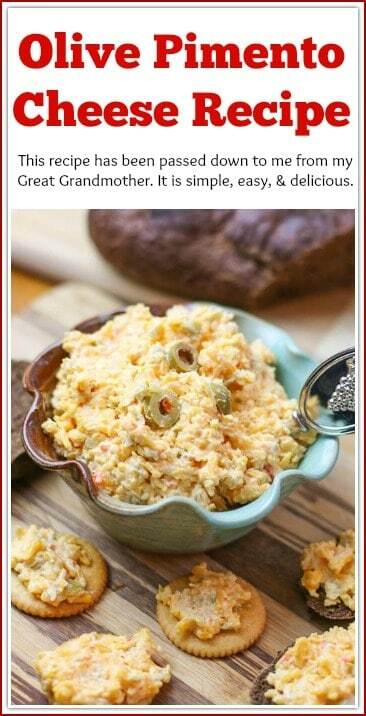 My mother says that when my great grandmother made this cheese spread, she only used the pimentos, not olives. 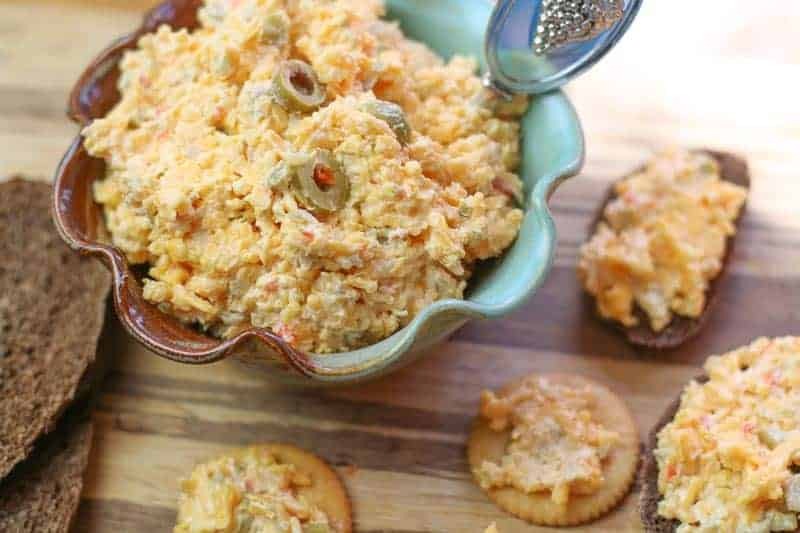 However, my great grandmother used the pimentos from the olive jar so that they would have the olive taste instead of the sweeter taste that the classic plain pimento flavor has. My mother started incorporating the olives when she made it for us. 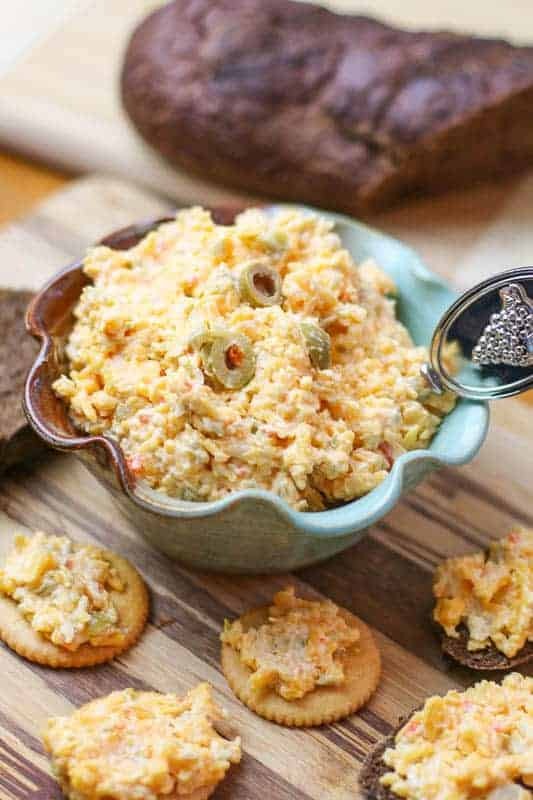 Because I grew up eating this pimento cheese spread with the olives, I kept the olives in this recipe. I love the salty bite the olives give this cheese spread. When I make this easy recipe it disappears…. So BEWARE! You may want to double the recipe. 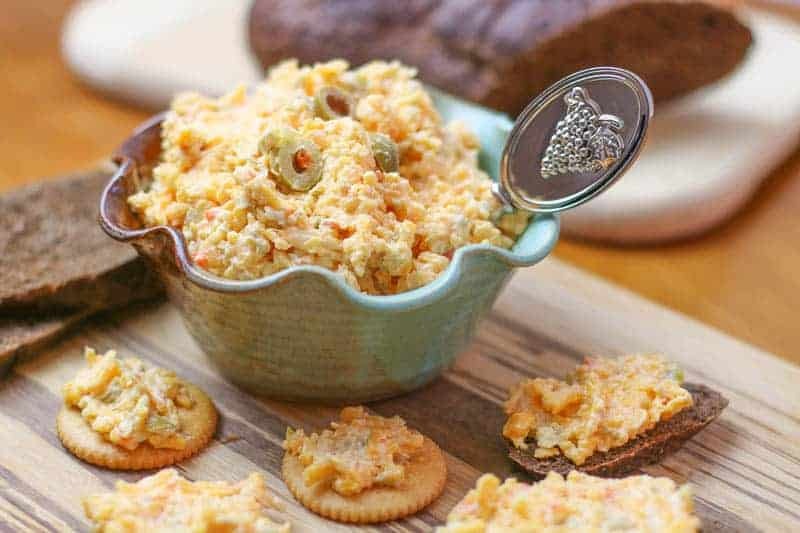 If you liked this easy homemade olive pimento cheese spread recipe, please leave me a comment and tell me how it went. If you like this recipe, check out: Easy Spicy Taco Dip, Easy Chicken and Pastry Recipe, Granny Moore’s Dressing, and Grandma Kriz’s Hash Brown Casserole. Mix cheese, mayonnaise, and olive juice until creamy. Add in olives and onion. Serve or store in refrigerator until ready to serve. This spread really tastes amazing over rye and pumpernickel bread. However, if you are on a low carb diet, it is great to spread over celery. A perfectly delicious appetizer to serve with crackers this holiday season! I would love some right now to snack on. This would be the perfect spread to have on my holiday or game day table. Sounds delicious. I will have to try it your way soon! I also have an heirloom olive/cheese recipe from my mother-in-law. The only big difference is mine calls for toasted pecans chopped roughly. It is so delicious! I love that this recipe has been handed down through the generations and it sounds great to serve as part of a party appetizer spread. This was one of my grandma’s favorites too! Including the Ritz crackers. I haven’t made this in such a while, but it brings back many fond memories. I think I’d like to try your version. Thanks for sharing it. mmm anything with olives and cheese sounds wonderful! Thanks for sharing! This recipe sounds so simple and easy to make, yet taste delicious. Such heirloom recipes are priceless treasures!! Family picture is lovely. Have a great weekend..